A few months back we blogged about our work with the police and HM Revenue and Customs to crack down on illegal foreign registered vehicles. 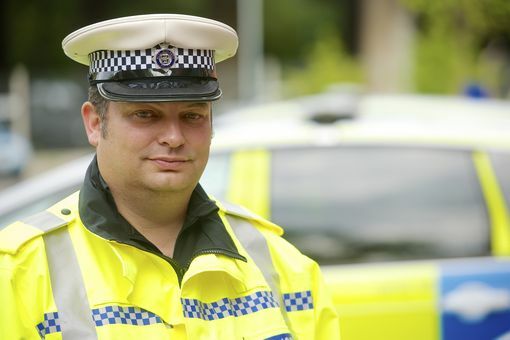 We recently caught up with Paul and asked him about his role as head of the Central Motorway Police Group (CMPG). Superintendent Paul Keasey, Head of CMPG. Initially when Paul started his career in the Police he was engaged in mostly local policing. He then had the opportunity to be involved in most facets of policing including intelligence, CID, strategy, policy and planning. His recent roles have been in roads policing. Paul is currently national lead for roads policing intelligence and the national operations commander for Operation Trivium. Thanks for agreeing to feature on our blog Paul, can you tell me about your role? I’m responsible for approximately 200 members of staff seconded from 3 of the region’s police forces (West Midlands, Staffordshire and West Mercia). When people think of CMPG it often conjures images of dealing with collisions on the motorway network or engaging with organised crime groups. We also have our own command and control function within the Highways England Regional Control Centre; which has a dedicated roads policing intelligence cell and provides the collision investigation capacity for West Midlands and Staffordshire Police. Where does DVLA fit in as part of your role? CMPG has been in existence for over 30 years and throughout this time we’ve enjoyed a close working relationship with DVLA. The recent reduction in border restrictions across Europe has seen an increase in our encounters with non-UK drivers. We’ve needed to develop our understanding around foreign licences and vehicle tax. Throughout this process, we’ve looked to our partners, DVLA, who have provided unfailing guidance and support. How has working with DVLA’s vehicle policy team, on cracking down illegal foreign vehicles, been beneficial? As a regional lead for foreign national offending I was very pleased when CMPG was approached to be involved in the Operation Jessica trial. Working together with DVLA and Her Majesty’s Revenue & Customs has already proved to make a real difference in tackling both public concerns and criminal matters. Initial indications show there is a real future in developing this work further which we, as the police, are really keen to do. What's your favourite part of the role? In essence, it’s all about making a difference. This is something that’s very important to me as it was when I joined the service over 20 years go. My current position means that I can create an environment that allows my staff to work towards clear objectives, Operation Jessica being one of these. By doing this, they’re able to make a difference which in turn has great benefits not only to our partnership but also to our region as a whole. And what do you find to be the most challenging aspect? The successes we’ve enjoyed through our involvement in Operation Jessica have been very encouraging. In the short length of time we’ve been provided with DVLA powers we have seized over 500 vehicles. It’s a shame that at the moment as a Police service we can’t embed this practice into all that we do. I’d love to see this become business as usual.